You are browsing the Blog for product. I have been exploring an alternative to syrup which is a bit easier and brings a different flavor profile to pancakes and waffles. Instead of a juicy topping, I used this new product from the butter people Land o Lakes – its a whipped butter with cinnamon already in it. To learn more and also enter to win the kewl stuff below in a giveaway visit this page on this blog! All you have to do to enter to win this cute prize pack is to leave a comment on this page telling us what new sort of butter you think Land O Lakes should make next! Contest starts today August 24, 2011 (when this posts) and ends August 31st, 2011, at 5 pm Pacific time (8 pm Eastern time) – that is one week! Please comment only once. You can enter one more time by tweeting this link – http://bit.ly/oLf79I – and adding this hashtag #myblogspark. 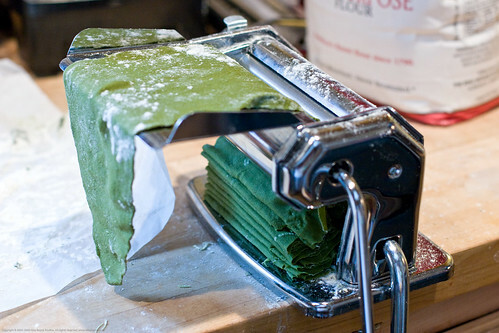 Making pasta with a machine – fun! The one I am going to share with you today is a piece of technology that can be enabling for even the most novice of cooks – a pasta maker. 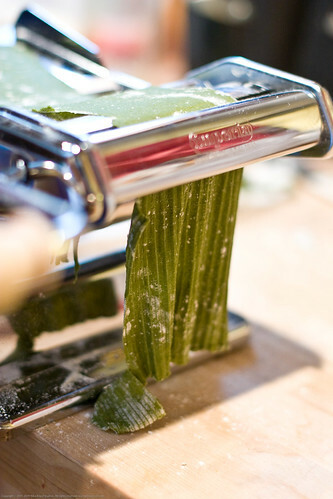 This one, a CucinaPro Imperia, is a step up from the most basic in that it can be attached to a motor as well as a variety of pasta cutting accessories. I am reviewing it without the motor and I find that using it without a motor is not at all difficult (as some might suggest if you look around on the web). In each of those cases (and the many many times I have made pasta without blogging about it) I rolled the pasta dough out by hand and also cut it by hand. There is a qualitative difference in process between making it by hand (the way I did it anyways) and by pasta machine. I minimized the amount of folding and kneading of the dough to the very minimum because I am generally the sort to do just that (my hands only have so much strength). 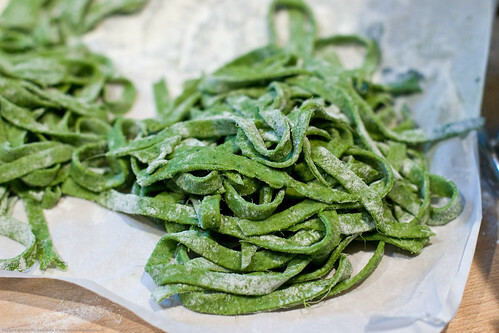 This leads to a heavier thicker dough and also same with the finished pasta. When you use the pasta maker, as I describe below, you get a much more homogenous pliable dough and you can get thinner pasta strands (if you wish). These both have their good points. Hand rolled and cut is thicker and “meatier” with more “dente” to it while the pasta machine gives a more standard pasta experience. The biggest advantage to making your own pasta is that you have 100% control over the quality of the basic ingredients and also, somehow even if made with bargain ingredients, it always tastes more delicious – much more savory and bursting with flavor. When it comes to pasta – fresh is best! 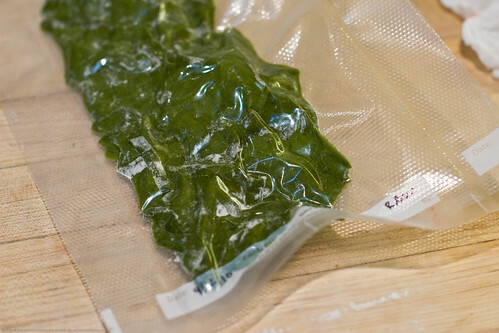 Puree the spinach in a blender VERY WELL – you want to molecularize the spinach as much as you can (I use my Vita Mix). Add the two eggs, oil, and water and mix well. In a bowl or in a stand mixer, add liquids to the flour and mix until you have a dough. 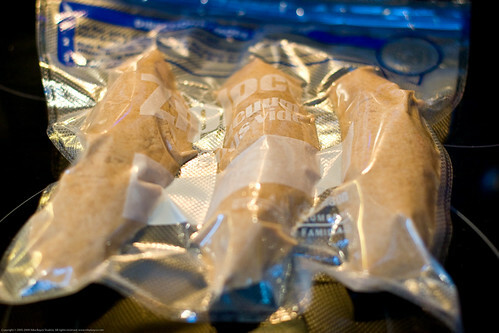 Wrap with plastic and allow to rest 30 minutes or longer. Overnight is good. You can also freeze it down at this point! 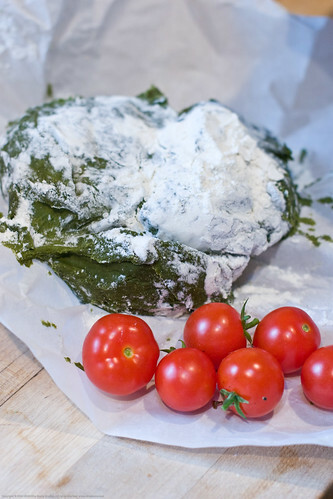 To thaw take out in the AM, put in the fridge, will likely be ready for you to shape by evening. I found that my thawed dough was simply fantastic because it had time to meld and hydrate well. 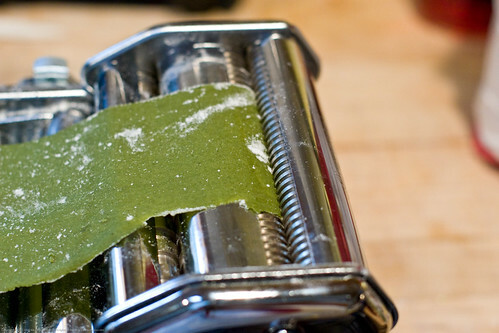 Once the dough has melded/rested, its time to either roll out and cut or to begin to use your pasta maker. You have to run the dough through the machine to condition it before you make your final sheets and then final pasta shape. First you make a log of a part of your dough, run it through, fold into thirds, rotate so that its 90 degrees from the direction you fed it in previously. Roll through. Repeat with the folding and turning. Do this 6-7 times or until the dough takes on a very even pliable consistency – a bit of practice will get you there. Now you begin to thin out your dough. You will no longer fold your sheet in third but run it through with successively thinner settings on the adjusting button on the side. If you are making ravioli, go for thin. If you are making other types of pasta like fettucini then do not let the sheet get too thin – its again a matter of practice for you. Once its a thickness you like/need, you can run it through the detachable pasta cutting accessory to get your finished product! You can now hang it all up to dry a bit and then use immediately (cook in boiling water for 2-3 minutes, depending on your tastes), dry it more for later, or freeze it down for later. 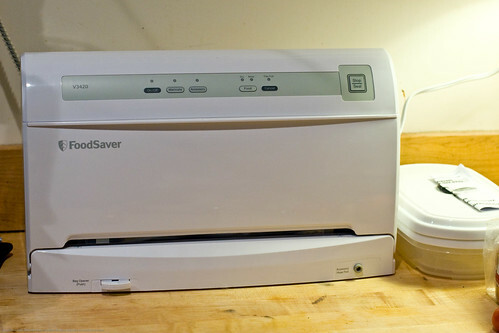 I wanted to test out my new FoodSaver vacuum system that I bought because we have a new freezer (we bought it from Sears – its awesome). 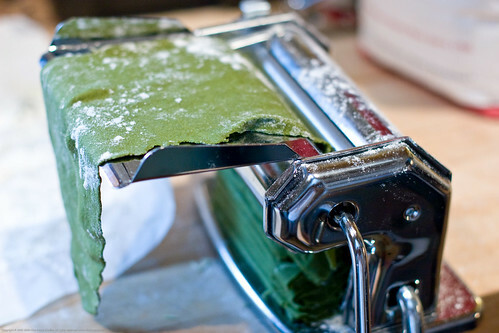 It mushes your fresh pasta back into dough. 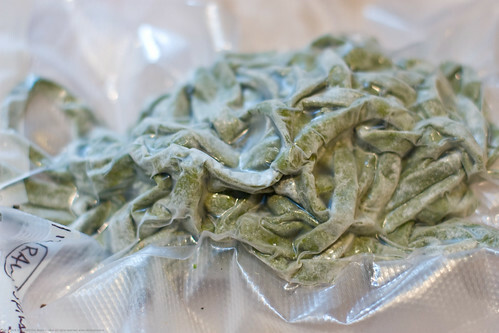 The solution is to freeze it FIRST and then vacuum seal it and then put it back in the freezer. Today I am sharing the results of an experiment I recently did while I had access to a trial Sous Vide Supreme unit. To the point, I wanted to see what happened when I used this hot water bath for making bread, something that would not take advantage of quite a few aspects of oven baking. This is not the first time that I have played with this machine, I wrote previously about Sous Vide here – St. Patricks day brisket â€“ sous vide style. That brisket was simply amazing! Sous vide cooking is excellent for applications where long slow cooking or really finicky temperature regulation is needed (fish, rare meat preps, etc). Just as a reminder, sous vide means “under vacuum” and when people refer to this method they usually mean the use of vacuum and hot water bath cooking. 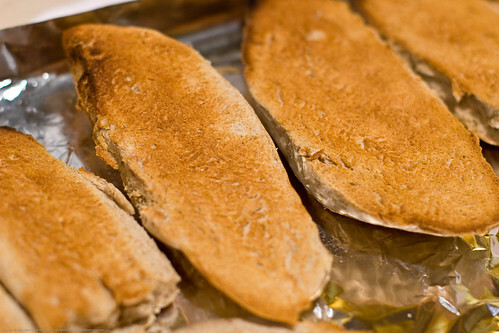 To do this experiment, I used a recipe that I have used many many times before from the Joy of Cooking and specifically the Whole Wheat bread Plus recipe found on page 559 of the 1997 edition. Set the sous vide bath temperature to 190 F (if you set it a bit higher, let it get there, and then set temperature to final desired temperature you may have better results). This is the temperature mentioned by bakers as the target finished internal temperature. Add yeast and sugar to 1/2 cup warm water, allow to rise 10 minutes. If it doesnt get foamy and smell yeasty, do not go forward with this recipe until you get fresh yeast. After 10 minutes, add everything but the flour and beat until incorporated. Add 4 cups unbleached white flour and incorporate. Add 4 cups whole wheat flour and incorporate. At this point you will be kneading the flour into the dough. Knead for 10 minutes until smooth. Rise in a warm place for 90 minutes (doubled) just once. 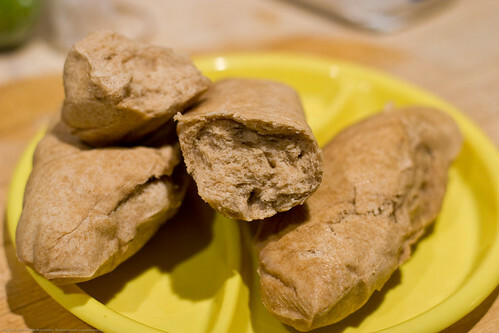 Bunch down dough and then form smallish baguette shaped loaves and then proceed with experimental part of this recipe, below. 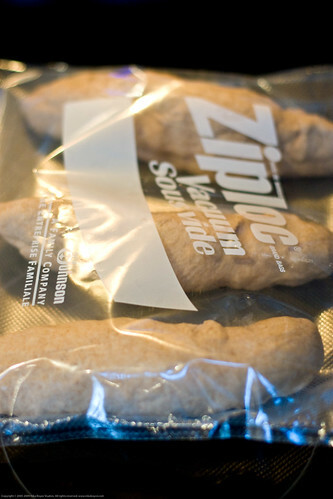 Put dough into sous vide bag. Seal bag and pull a vacuum. Put into sous vide machine and leave for about 1 1/2 hours. 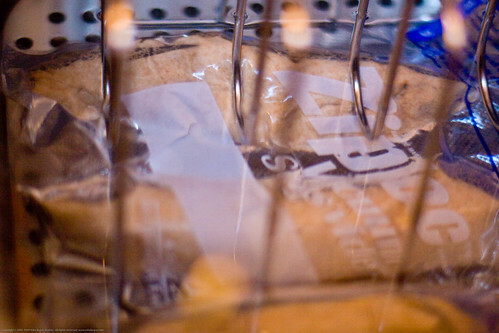 You will have to prod your bread at times, perhaps even open the bag and check the internal temp or moistness of the bread to get a feel for what is going on. Remove bread and this is what you get. I sliced them in half and then toasted them to make a sort of garlic bread concept. The bread came out like bread which was the main hack. The exterior doesnt have a nice crust because of the method but it didnt come out slimy, just sort of springy. Might be a great way to make bao? The crumb was dense and not as flavorful as this recipe can yield. So, I made bread in the sous vide but I wont again because the baking in the oven yields a superior result that cant even be recaptured via toasting. Does the idea of mixing pomegranate juice with iced coffee make your eyes bug out like the cute little lamby slippers above? POM has done this craaazy thing with their POM iced coffees. .. (click for more) ..